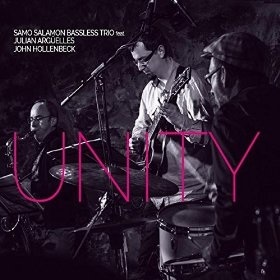 Samo Salamon has a knack for putting himself in the company of great musicians; like his previous recordings, this trio set has all the appearances of a super-group pulled together for the recording date. If the name Samo Salamon is new to you, then the obvious question is why do the great and good of the contemporary jazz world line up to play alongside him? On the evidence of this recording, there are two answers to this question. The trio is playing pieces composed by Salamon, whose simple, staccato and sparse melodies leave plenty of space for the soloists to develop the repeating themes. On first listen, this could be a Julian Arguelles session, so well does he lead the pieces and so imaginatively does he develop his solos. Arguelles’ playing is fantastic across all of the pieces on show here, playing the repeated themes with sufficient variation to keep them interesting and developing solos that really take off. I think that this points to the first reason why people want to play with Salamon: he generously gives soloists centre stage and provides them with superb tunes to showcase their talents. If this sounds like he then modestly hides in the shadows, this is not the case. The second reason why people would want to play on his recordings is the breadth of guitar playing on show. It sounds as if he has bass guitar strings on the two lower strings, so deep and resonant does his lower playing sound. In the lower register, his playing hints at the bass lines of the pieces (hence the ‘bassless trio’ tag) and in the upper register, a lighter gauge on the higher strings, allows him to shadow or accompany the tune (often in the same piece, swapping between these different roles). That his guitar playing has no obvious role model is testament to his talent as a guitarist and provides for a truly original voice on jazz guitar. The CD is recorded live on a European tour, but most of the tracks have little, if any audience noise. The audience applauds at the end of track 5 and tracks 7 and 9 ends with wildly enthusiastic hollering and whooping, and Salamon naming-checking the players. Perhaps, for the most part, the audience were simply mesmerised by the beauty of these pieces and the tight playing of the trio. Arguelles plays the tunes with obvious delight, Salamon providing intuitive and on-the-button accompaniment and Hollenbeck moves between supporting the players and driving the rhythm. The trio really work well together and feel as if they’ve been playing for years, rather than (presumably) a few months prior to the tour. Things take a turn on track five (‘Soundgarden’) and track seven (‘Drop the D’), where power chords kick in and Salamon solos with verve and energy (on track five) and plays some superbly orchestrated noise (track seven). I’m not sure the extent to which Salamon is playing through effects pedals but it sounds to me as if the noises that he is coaxing from his guitar are arise from his technique and skill, which is all the more admirable given that the recordings are live. The heavier sound of tracks and five and seven differ markedly from the earlier pieces, showcasing a very different approach to guitar playing and a more spontaneous ensemble-led improvisation. But the contrast between the gentler pieces and these harder ones towards the end works excellently and shows Samo Salamon to a major exponent of jazz guitar and a really interesting composer to follow over the coming years.